One of the several reasons why I love knitting is the sense of gratification one gets by seeing your project grow. You can see your progress, your efforts and time becoming a thing. This past weekend, I saw the efforts of my labour come together fairly quickly as I’m knitting away for Christmas and, conveniently at the same time, working away at my stash. I can write about these projects because a) I’m not specifying for whom they were made, and b) I doubt the recipients will read this blog. I think this is a safe space. If you think you know the destined recipients, please, keep my secret!! Saturday evening, this beauty flew off my needles. Bulky weight, 6 millimetre needles. 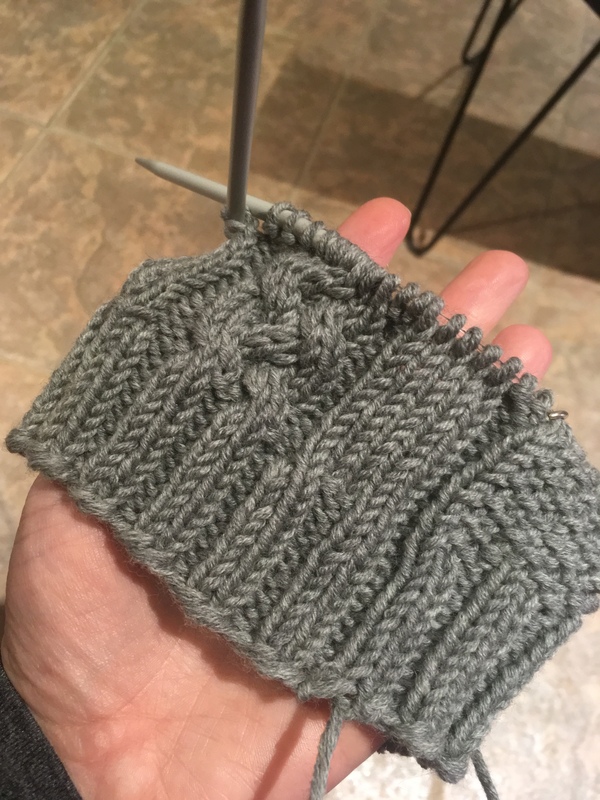 I LOVE how simple the hat is, but then the designer hit you with a pop of interest with the crown decrease and these lovely cables. 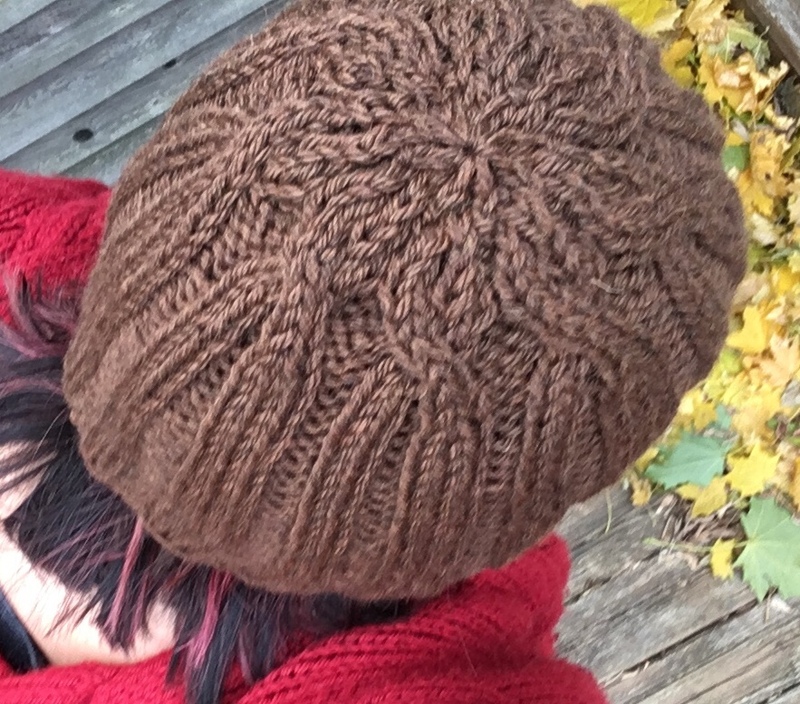 The pattern is Subtle Twist Hat by Jennifer Tallapaneni, and I used up the better part of a skein of Berroco Vintage Chunky. I’ve also started a hat I’ve been wanting to make for a while, Pathways by Erica Harbin. This lovely hat was inspired by one worn on the show Once Upon a Time, and the first season of that show was filled with lovely pieces of knitwear. 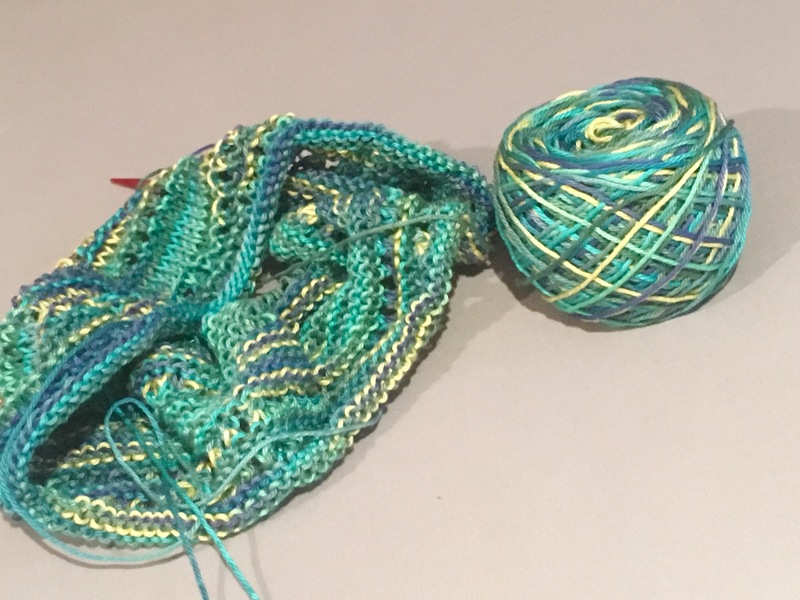 I’ve had Schachenmayr Merino Extrafine 85 in my stash for years now, and it is working up like a dream in this project! The plying of this yarn is unusual, but it’s not affecting the fabric being created, so I’m happy. I may find excuses to knit a few more hats because they are a seriously quick project, and I’m rather happy to find use for yarn that I’ve had on the shelves for some time now. The Mercury is dropping and a few snowflakes have fluttered by. Winter is coming, friends. I’m sure it won’t be hard to find reasons for hats. I’d like to know who is propagating the myth that Canada is a cold country, because for the last week or two, southern Ontario has been hit with a heat wave. Temperatures are in the 30sC and feeling like 40sC (which, thanks to a handy conversion online, I can tell you is high 80s/90s in Fahrenheit). It’s hot. It’s especially hot for someone who doesn’t have air conditioning, and while I was able to fare quite well in the first few days, I very quickly lost the battle in trying to keep my house at a normal, comfortable living temperature. New fans have been purchased, I relish my time at work with AC, and I’ve gone to a movie or two to escape the heat. It was also quite lucky that we got a reprieve over the weekend and it cooled off somewhat, but summer has most certainly arrived, and she’s come with a vengeance! This heat has also affected my knitting behaviours. My Doodler shawl, made with wool blend yarns, had to be put aside because working the the fibres was like a strange form of cruelty to myself. Instead, I’m gravitating towards cottons. My Boxy sweater has come along with me to a few movies. It’s knit in the round over what feels like a bazillion stitches, and right now I’m working towards almost a foot and a half in plain stockinette. It’s a perfect movie project, being worked in Berroco’s Weekend. Also getting some attention as of late is my Sanibel Cowl, worked in Cascade’s Ultra Pima Paints. I’m so in love with these colours, which is why I bought the skein to begin with. I also adore how soft Ultra Pima feels, with excellent drape. I’m looking forward to finishing this project, although I have a feeling wearing it won’t be possible until the first few autumnal days. So, to that person who goes around asking Canadians if they live in igloos and take their dog sled to work, please, come visit the Greater Toronto Area. Not an igloo in sight, although one would be a welcome relief from the heat. I love my local yarn shops. I have four in my city and neighbouring towns that I visit with some frequency (much to the chagrin of my bank account). One such neighbouring LYS is Soper Creek Yarns, and every year around this time, they host a yarn challenge. I talked about this last year when I bought my first kit and participated for the first time. Well it’s back for 2017 and I’m super excited to cast on! Berroco Remix Light in three colourways. I have a pattern picked out, and I’ll be casting on later today. As the Yarn Challenge is a contest – shop visitors vote on their favourite finished objects – and anonymity is key to its success and a big part of the fun, I won’t share my chosen pattern or the finished object until after the contest is over. For now, check out the pretty yarn and just imagine all the possible things one could knit with it. I have nothing against these ladders. I consider myself a fairly experienced knitter. Sure, there are things that throw me for a loop sometimes (knitting pun unintentional, just a very happy coincidence), but I’m proud of my skills and what I can do with sticks and string. 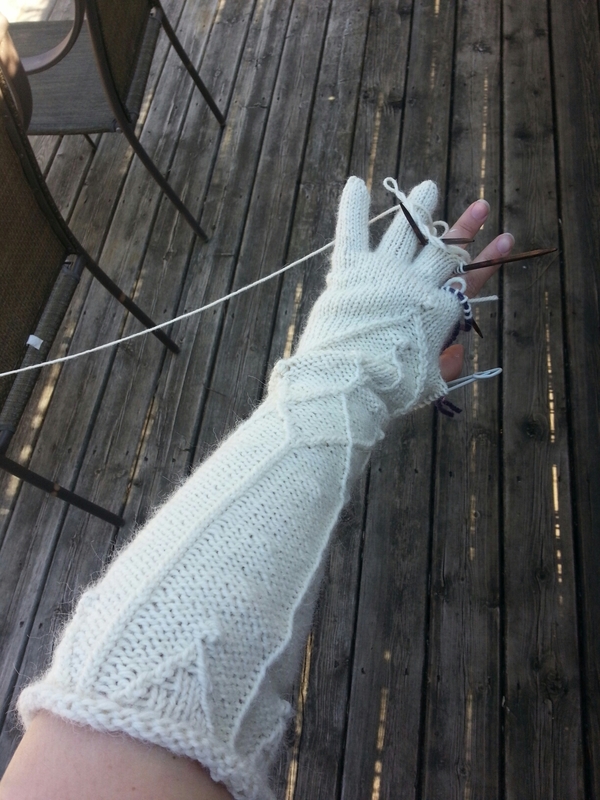 And then, every so often, a project comes along that keeps me humble – these mittens is one such pattern. A volunteer at my Museum came to me and asked me to make her a pair of mittens, and in exchange this very talented sewer will make me a few accessories to go with my costume. A very fair trade and I happily accepted. I bought the amazing yarn (Berroco Ultra Alpaca, cream in colour), cast on to my DPNs and started knitting. And then they started. The ladders. Those cursed ladders. Regardless of how I was snugging the yarn before the start of each needle, they just kept coming, and in my mind, getting worse with each round. 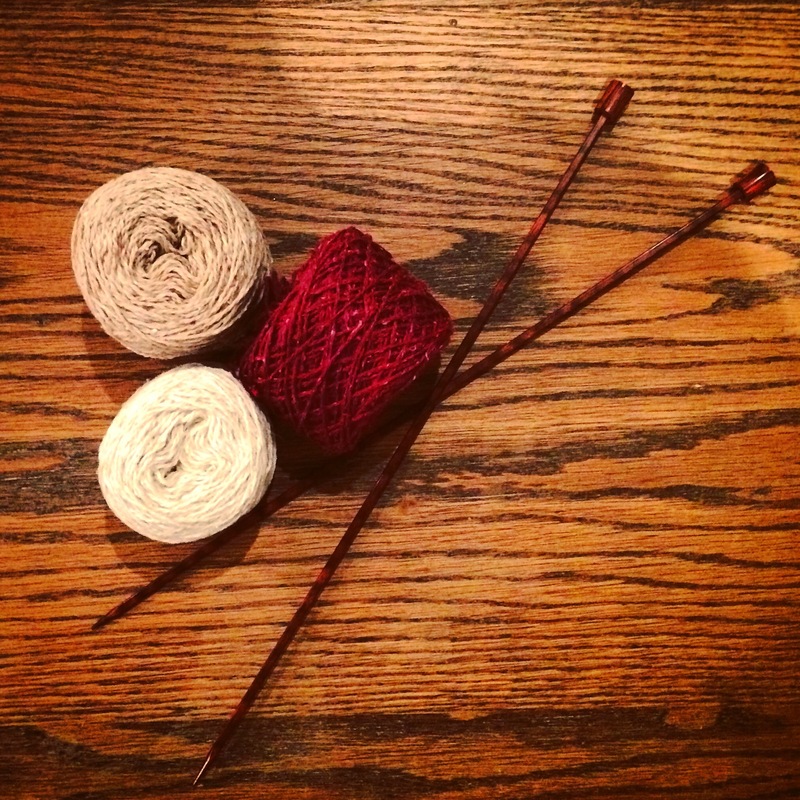 I turned to the Ravelry community and their oh-so helpful forums for advise, and ultimately, I dashed out to my LYS and bought circular needles with a very short cable. Frogged, cast on, and away I went.